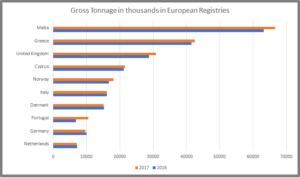 The graphs show a comparison between the Top Ten European Flag States, in relation to number of Merchant vessels registered and gross tonnage registered in European registries. The figures cover seagoing propelled merchant ships of 100 gross tons and above, excluding inland waterway vessels, fishing vessels, military vessels, yachts, and offshore fixed and mobile platforms and barges (with the exception of FPSO – floating production, storage and offloading vessels – and drillships). The top graph compares the different European Flag State’s growth or reduction in regards to the number of Merchant vessels registered between 2011 and 2017. 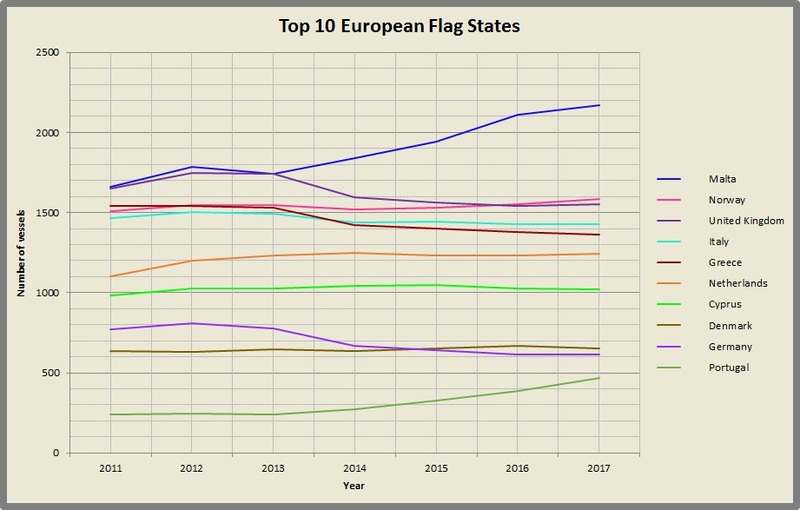 In the following graph one can see the comparison of the top 10 European Flag States in regards to gross registered tonnage for the years 2017 and 2016.